Dozens of members of Hamas have quietly returned to Gaza from Damascus, according to diplomats. Dozens of members of the Hamas terror group have quietly returned to Gaza from Damascus, as the group scales back its presence in Syria, diplomats told the Reuters news agency on Sunday. While Hamas’ leaders are denying they plan to quit the Syrian capital, where the group keeps its main headquarters outside Gaza, diplomats and regional sources told Reuters the Hamas delegation in Damascus, which once numbered hundreds, has shrunk to a few dozen. The sources said the departures were speeded up by the Arab League’s recent suspension of Syria over its military crackdown on anti-regime protesters, adding that dozens of Hamas operatives and their families, who had lived in Syria since the 1990s, and others who moved there in recent years have returned to Gaza via Egypt in recent weeks. 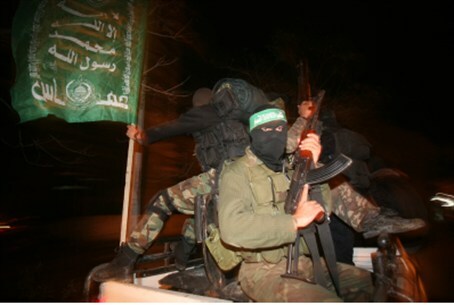 Reports surfaced last May that Hamas is moving its headquarters from Damascus to Egypt and the terror group is strengthening itself in the Sinai. Some reports claimed that the Damascus-based Hamas leadership left Syria after the Syrian government asked the Hamas leaders to leave. Hamas spokesman Sami Abu Zuhri denied on Sunday that the group is leaving Syria, saying that “there is no change” when asked by Reuters about Hamas presence in Damascus. In September, however, Hamas co-founder Mahmoud al-Zahar announced that the terror movement may relocate its headquarters from Damascus to Cairo. Hamas angered Syria in recent months by refusing to hold rallies in Palestinian Authority Arab refugee camps in support of Bashar Assad’s government, Reuters noted. Tensions with Damascus rose further, the report added, when Hamas opted not to sign a statement by nine other PA-based groups, including the Palestine Liberation Organization, in support of the Syrian leader.